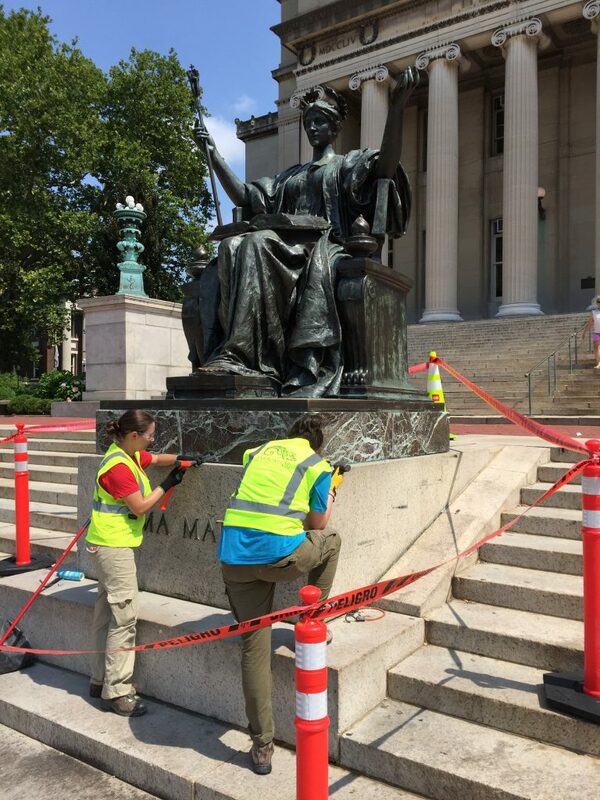 Columbia’s Office of Communications and Public Affairs has released this new video documenting some of the recent conservation work that took place on campus this summer. Stay tuned for more photos and information about some of the sculptures recently conserved on campus. 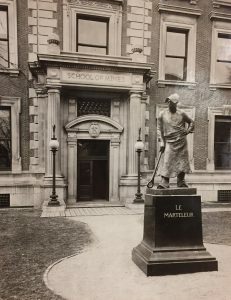 This entry was posted in Morningside and tagged Alma Mater, Battle of Harlem Heights, conservation, CU photos, Daniel Chester French, James Edward Kelly, videos on August 15, 2018 by Roberto Ferrari. 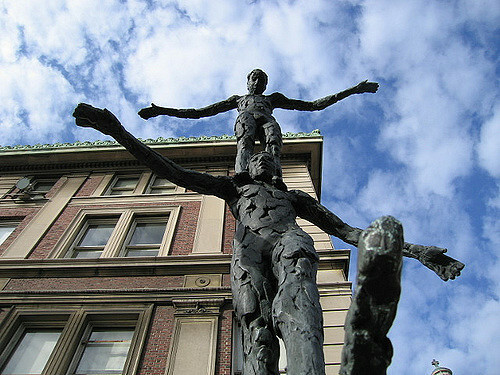 The following post was written by Juan Alvarez, a student in the “Public Outdoor Sculpture at Columbia and Barnard” undergraduate seminar in Spring 2017. This excerpt from his research paper discusses Columbia’s famous lion mascot and the sculpture of the lion near the entrance to the Dodge Fitness Center, installed on campus in 2004. Columbia’s sculpture of the Scholars’ Lion by Greg Wyatt stands on a large granite pedestal and faces East. It is a larger-than-life walking lion made in bronze. With his eyes wide open, the lion is patrolling his territory. The so-called “King of the Jungle” walks on massive, even oversized, paws that demonstrate its potential for violence while maintaining a focused and calm demeanor. His mouth is open, exposing razor-sharp canines to warn those who would threaten him. 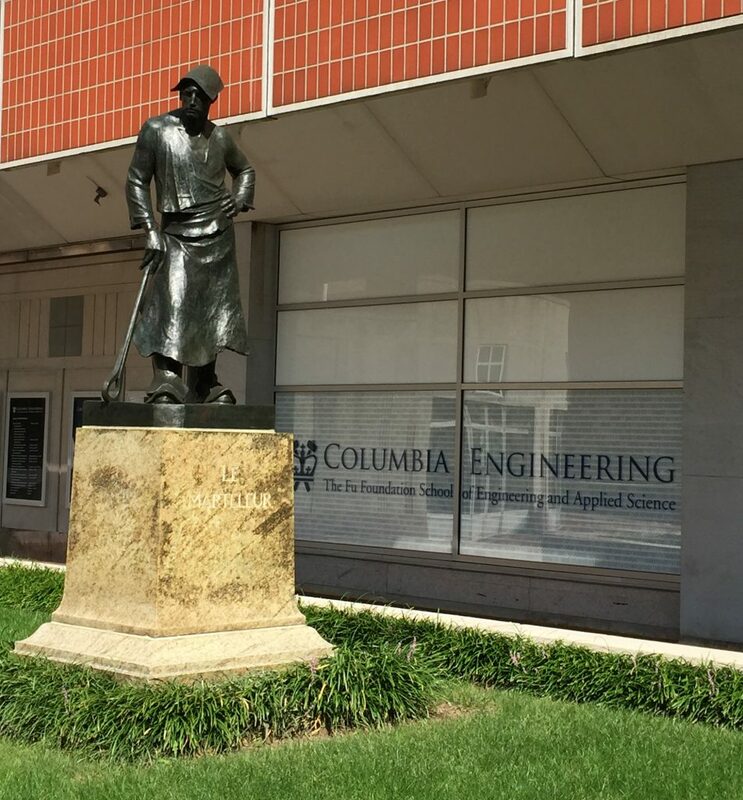 Yet, there is a grace to the figure, and a feeling of awe may overcome the viewer after just a few moments of contemplating this sculpture of Columbia’s mascot. From the cave paintings in Chauvet, France to the lion hunt reliefs of Assyrian king Ashurnasipal II, man has been obsessed with the image of this animal to express power, strength, virility, and divine right. The decision to make the lion the mascot for Columbia may seem obvious, and if asked the majority of students might assume it was adopted at the time of the school’s founding in 1754. The truth is that Columbia had no mascot until April 1910, when the Columbia Alumni Association voted and finally passed a motion making the lion the official mascot. At the same event, a banner in blue and white with a rampant lion was presented to Pres. Nicholas Murray Butler by George Brokaw Compton (CC’09 and Law ’13). But the rampant lion was not popular with all students and the new mascot had its challengers. Runner up for the prestigious position was a feral goat that roamed the campus grounds and was named “Matilda the Harlem Goat.” In a letter to the editor of Columbia Alumni News, an anonymous writer argued for the goat, saying that it called Morningside its home just like the University. Others were not so much opposed to the lion but rather the connection of the rampant lion to the British royal family. They wanted instead a symbol that was more in line with America, like the eagle. 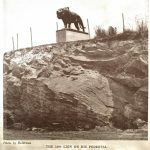 By 1924, however, the lion was firmly in place as the mascot for the school when the Class of 1899 took on the task of making the lion’s presence official for their 25th reunion (and Columbia’s 170th anniversary) by presenting a bronze lion to the University to be placed on a rocky outcropping at Baker Field, overlooking the football practice field. American animalier sculptor Frederick Roth was commissioned to sculpt the lion and McKim, Meade & White the pedestal. 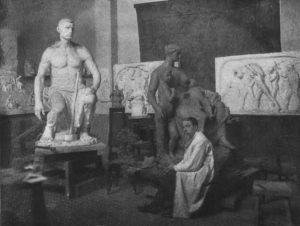 Roth was selected because of his artistic credentials, including being the president of the National Sculpture Society and the sculptor of the Princeton Tiger. On June 4, 1924 the Columbia Lion was presented with great fanfare by Pres. Butler, standing on its rocky outcropping. It was later moved to ground-level at Baker Field where it stands today. Wyatt produced multiple sketches and at least two models, the first versions of which were described as being too anthropomorphic and lacking in ferocity. Wyatt responded with more drawings and worked the models tirelessly, finally settling on the depiction seen today, with the lion walking and his mouth open, exposing his teeth. 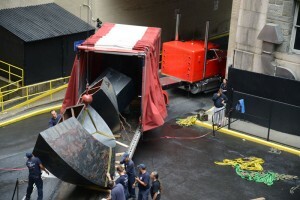 The original site for the sculpture was supposed to be outside John Jay Hall, but University Administration decided instead that the sculpture should mark the entrance to the Dodge Fitness Center because of the mascot’s ties to athletics. 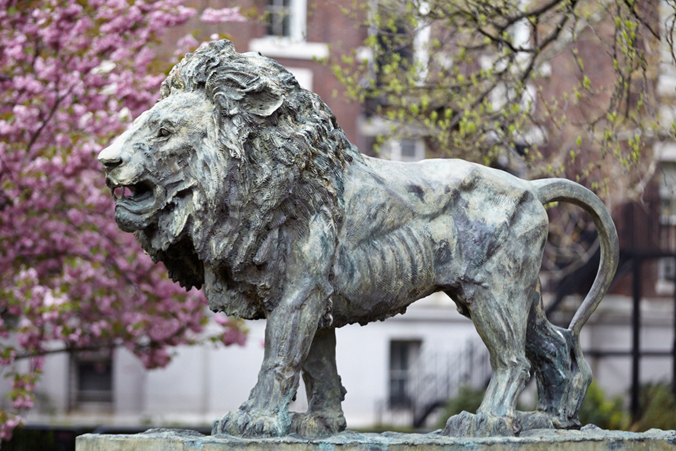 On April 7, 2004, Scholars’ Lion was unveiled in a public ceremony that coincided with Columbia’s 250th anniversary. “Leo Columbiae,” Columbia Alumni News, April 20, 1910, Rare Book and Manuscripts Library, Columbia University, p. 4. “Comment,” Columbia Alumni News, April 13, 1910, p.1. George S. Hellman to William Mitchell Kendall, Esq., June 7, 1923, Curatorial File: C00.706, Art Properties, Avery Architectural & Fine Arts Library, Columbia University. Ernest A. Cardozo, “The Origins of Leo Columbiae,” in Columbian Yearbook 1929, Rare Book and Manuscripts Library, Columbia University, pp. 34-37; John William Robson, A Guide to Columbia University (New York: Columbia University Press, 1937), p. 196. “A Glorious Twenty-Fifth Anniversary,” Columbia Alumni News, June 1924, p. 509. Shira Boss, “The Scholarly Artist,” Columbia College Today (Summer 2016), available online: https://www.college.columbia.edu/cct/issue/summer16/article/scholarly-artist. Comments attached to Angela Giral to Jonathan Cole, July 25, 1997, Curatorial File: 2004.1, Art Properties, Avery Architectural & Fine Arts Library, Columbia University. Joshua Rubenstein to Greg Wyatt, April 28, 1998, ibid. Johnathan O. Mirian, “A Lion’s Job,” in Columbia Daily Spectator, September 21, 2001, available online: http://spectatorarchive.library.columbia.edu/cgi-bin/columbia?a=d&d=cs20010921-01.2.4&srpos=1&e=——-en-20–1–txt-txIN-greg+wyatt—–#. Sally Weiner to Brian Bodine, June 4, 1998, Curatorial File: 2004.1; Alex Sachare, “Scholars’ Lion Unveiling Highlights Deans Day,” Columbia College Today (May 2004), available online: http://www.college.columbia.edu/cct_archive/may04/quads2.php. This entry was posted in Baker Field, Morningside and tagged Columbia Lion, Frederick Roth, Greg Wyatt, Scholars Lion, Teaching projects, University Archives on October 12, 2017 by Roberto Ferrari. 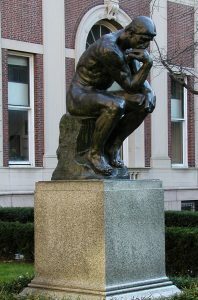 During the Spring 2017 semester, Prof. Robert Harrist and Curator Roberto C. Ferrari co-taught an undergraduate seminar entitled “Public Outdoor Sculpture at Columbia and Barnard.” The idea for the course was inspired by the recent acquisition of Henry Moore’s Reclining Figure, and the subsequent controversy which followed its proposed installation. Reinforcing the educational mission of the University’s art collection, this seminar was a prime opportunity to teach from Columbia’s permanent art collection utilizing sculpture that students, faculty, and staff see everyday on campus but know little about it. Each of the students took on a final research project associated with one of the sculptures. Over the next few months, excerpts from some of their project reports will be made available on this blog, enabling everyone to learn more about the history of these works of art and their association with Columbia’s history. We begin with Barnard College student Isabel Dicker, who became fascinated by the sculpture on Revson Plaza known as the Tightrope Walker by the Dutch modernist sculptor Kees Verkade. This sculpture was unveiled in 1979 as a dedicated memorial to Gen. William J. “Wild Bill” Donovan, a graduate of Columbia College and Columbia Law School. The depiction of two tightrope walkers on one another’s shoulders was intended to symbolize the dangers and risks Donovan took protecting America in the battlefields, as well as his later career in the precursor of the CIA and as a lawyer. During the summer the marble base of the sculpture was destroyed. Fortunately, the sculpture itself is intact and did not suffer any damage. 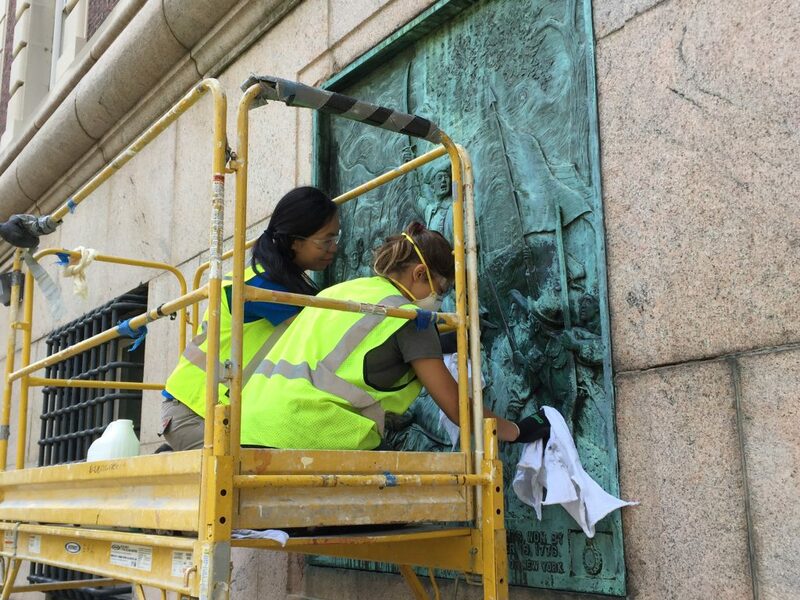 The marble sheathing around the sculpture’s base will be repaired or replaced in the months to come. This entry was posted in Morningside and tagged Kees Verkade, Teaching projects, Tight Rope Walkers on August 28, 2017 by Roberto Ferrari. It’s been nine months since Henry Moore’s Reclining Figure, 1969-70, was installed on the Morningside campus on the lawn outside Havemeyer and Mathematics Halls. The response has been so positive since the installation last December. The statue’s new home in a green space likely would have pleased Moore, who preferred that his sculpture was viewed surrounded by nature. 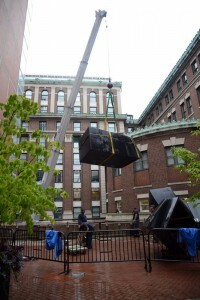 To read more about the sculpture and to see a video of the dedication ceremony thanking David and Laura Finn for their generous gift, go to http://news.columbia.edu/Henry-Moore-Sculpture-Joins-Public-Art-Collection-on-Columbia-Morningside-Campus. This entry was posted in Morningside and tagged AP photos, Henry Moore, Reclining Figure, videos on August 28, 2017 by Roberto Ferrari. New Public Outdoor Sculpture by Henry Moore…Coming Soon! 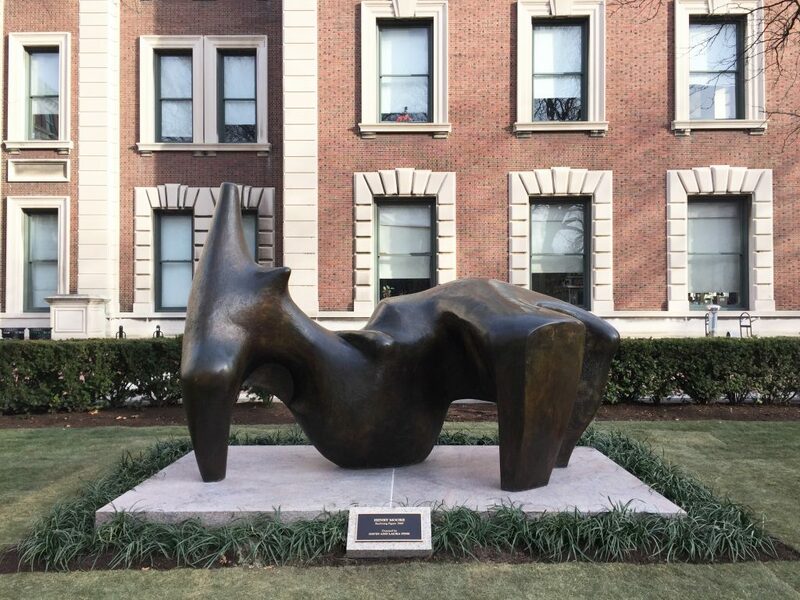 Columbia University is honored to be the recipient of a significant donation of a public outdoor sculpture by Henry Moore (1898-1986), one of the most important British sculptors of the twentieth century. 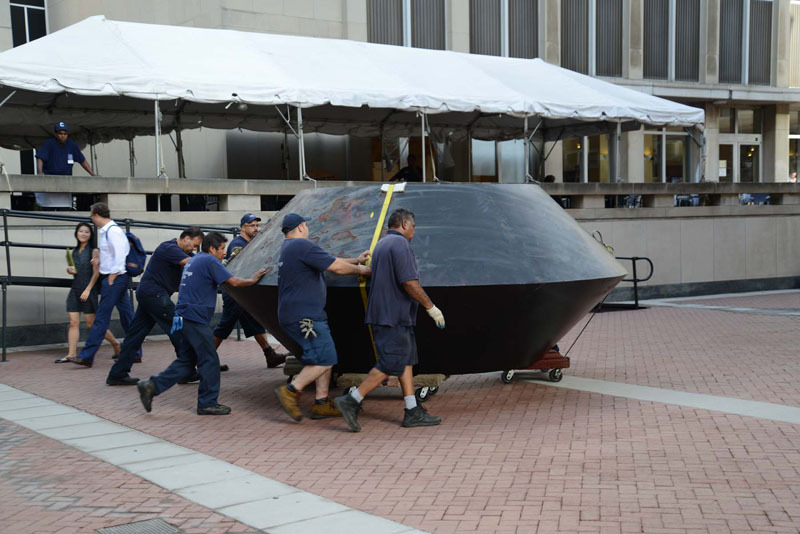 Preparation for the installation of Reclining Figure, which measures approximately 9 x 11 x 7 feet and is cast in bronze, will begin this week at the Morningside Campus on the central lawn near the entrance to Butler Library. The donation of this sculpture was accepted by the Committee on Art Properties and University administration over twenty years ago, with the permanent location approved more recently. The photograph seen above was taken in 2014 and shows the sculpture in its pre-conservation state. The donors, David and Laura Finn, were long-time friends of the sculptor. Mr. Finn is a fine-art photographer who has published numerous books on photographing sculpture, and is a co-founder of Ruder Finn Inc., the public relations agency. The Finns’ children are alumni of Columbia. Early in his career, Henry Moore embraced abstraction through sculptural forms, but his works consistently call to mind figurative subjects. Columbia’s newest public outdoor sculpture, Reclining Figure, is meant to suggest the form of a woman with her legs outstretched before her, propping herself up with her forearm. This work was designed by Moore from 1969 to 1970 and subsequently cast in bronze by Hermann Noack in Berlin. Columbia’s cast is number 5 of 6, with repetitions of this important work on display in cities such as Hakone, Japan; Humlebaek, Denmark; and Tel Aviv, Israel. 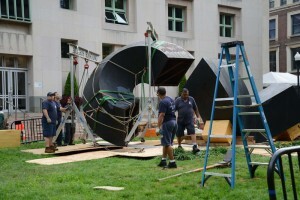 Once installed on campus, this sculpture will make Columbia only the second university in the United States, after M.I.T., to have on permanent display two public outdoor sculptures by Moore. 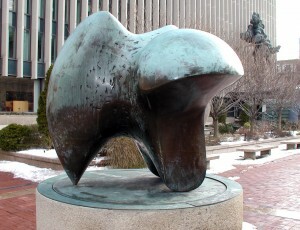 Columbia’s other Moore sculpture, Three-Way Piece, No. 1: Points, located on Revson Plaza, was donated in 1967 by Miriam and Ira D. Wallach. UPDATE (November 17, 2016): Following many months of discussion, University Administration, with the support of the donors, decided to change the location of this sculpture to the lawn just south of Havemeyer and east of Mathematics, where it will better harmonize with the natural environment, situated between two trees. The concrete base is now in place, and we are looking forward to installing and showcasing this remarkable sculpture by Moore in the coming weeks. 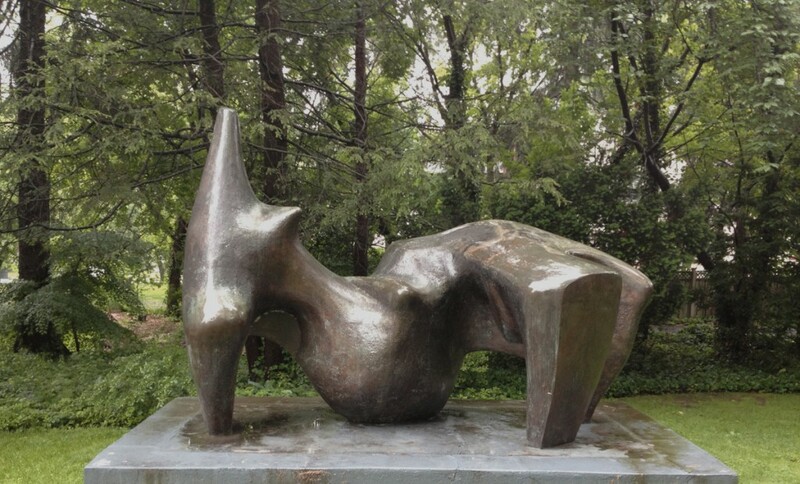 This entry was posted in Morningside and tagged AP photos, Henry Moore, Reclining Figure, Three-Way Piece on March 21, 2016 by Roberto Ferrari. 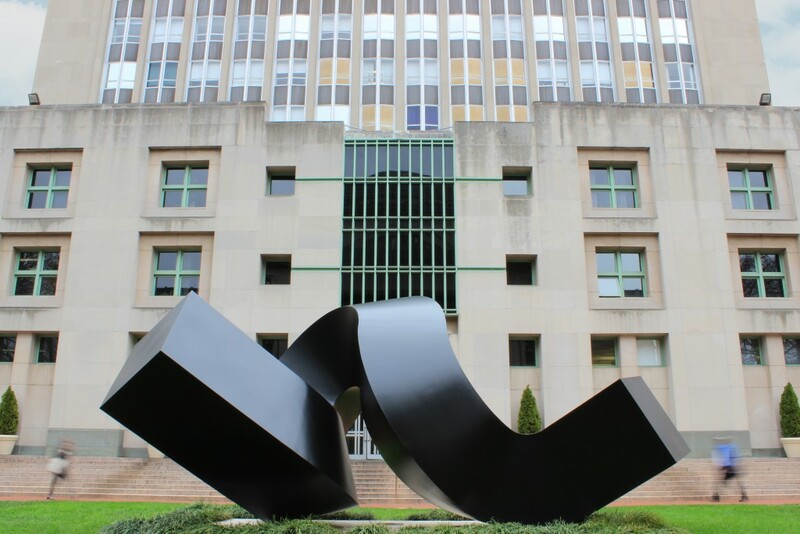 Anyone walking past Uris Hall these days will now notice that Clement Meadmore’s sculpture The Curl is looking better than ever, or at least better than it has for the past 15+ years. Seeing it in its newly-conserved state, the viewer can appreciate fully Meadmore’s intent of using the painted surface of the sculpture to create a sleek, sinuous form that belies the weight and hard materiality of its Cor-Ten structure. Although rust is a natural part of the appeal of Cor-Ten steel, environmental conditions led to the erosion of the steel in some parts and an adverse reaction with the paint. After nearly three months of conservation work spearheaded by Conservation Solutions, Inc.–to whom we owe our thanks for all their hard work–we are now pleased to showcase Meadmore’s masterpiece in its newly-conserved state. Upon seeing the sculpture, Ellen Goldberg, Trustee of the Meadmore Foundation, recently responded with exuberance that “Clem” would be thrilled with the results. 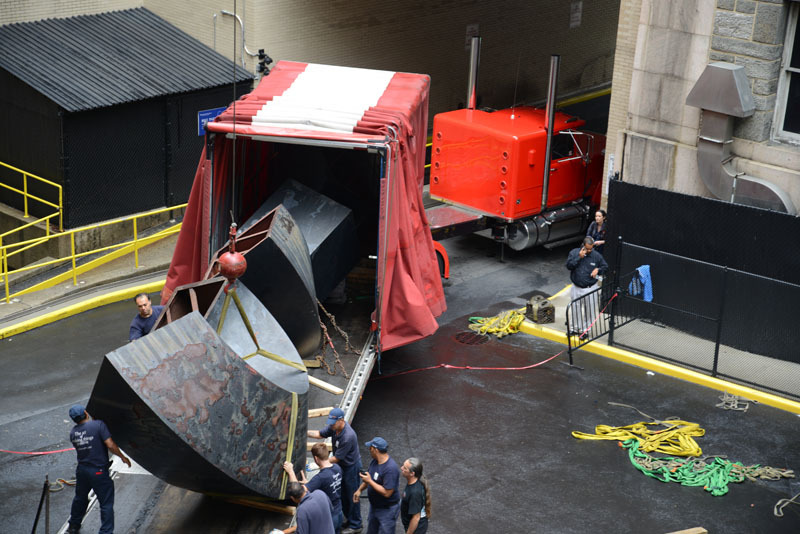 In September, The Curl was dismantled and removed from the campus, then traveled to Virginia, where in a warehouse layers of old paint were removed and the entire sculpture pressure-cleaned to remove all the rust. Areas of degradation and fissures in the surface were repaired with new steel. The entire sculpture was then sprayed with a zinc coating to strengthen its resistance to natural degradation, then sanded to create an even surface, but respecting the original surface conditions from when the sculpture was first made. 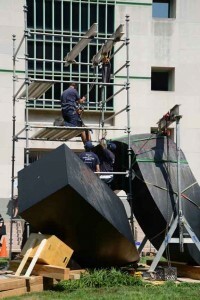 Once the sculpture returned to campus, it was housed in a tent so the final coats of paint could be rolled on, as they would have been applied in Meadmore’s day. Only when the sculpture was fully dry and cured was the tent removed to reveal the sculpture in its revitalized form. To see more photos of the return of the sculpture to campus, go to the Avery Library blog, https://blogs.cul.columbia.edu/avery/2015/12/22/the-curl-is-back/. A brief rededication ceremony was held on December 16, 2015, to celebrate the beauty of this sculpture and its importance to Columbia, and to acknowledge all of Columbia’s partners for their critical roles in bringing this project to fruition: Office of the Provost, Columbia Business School, Columbia University Facilities, Columbia University Libraries, the Meadmore Task Force and the Committee on Art Properties. 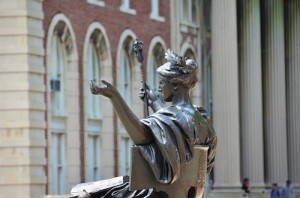 To see the latest video produced by Columbia’s Office of Communications about The Curl, including historical footage and highlights from the recent rededication ceremony, go to https://vimeo.com/columbiauniversity/review/149888572/2bfc55c0a5. As with all the public outdoor sculpture, we kindly remind everyone to please respect these sculptures by not climbing on them or abusing or vandalizing them in any way. By doing this, you are helping to ensure the long-term preservation of these important art works for generations to come. Thank you. Image Credit: Clement Meadmore, The Curl, 1968, Cor-Ten steel with paint, Gift of Percy Uris (1968.3.1), Photo: Brett Essler, Columbia Business School. This entry was posted in Morningside and tagged CBS photos, Clement Meadmore, conservation, Curl on December 22, 2015 by Roberto Ferrari. 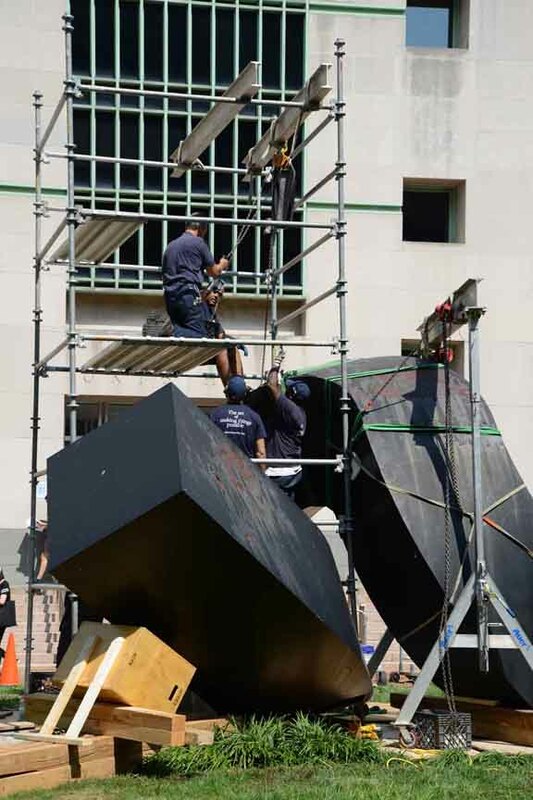 Here are a few recent photos, taken by Avery Library’s Registrar & Digital Content Librarian, showing the dismantling of Clement Meadmore’s Curl as it makes its way off-site to be conserved and returned later in the fall semester. To see even more great images, visit the Avery Library blog for images from Day 1, Day 2, and Day 3 of the dismantling process. If you have your own images that you want to share with us, email them to artproperties@library.columbia.edu. This entry was posted in Morningside and tagged AP photos, Clement Meadmore, conservation, Curl on September 10, 2015 by Roberto Ferrari.